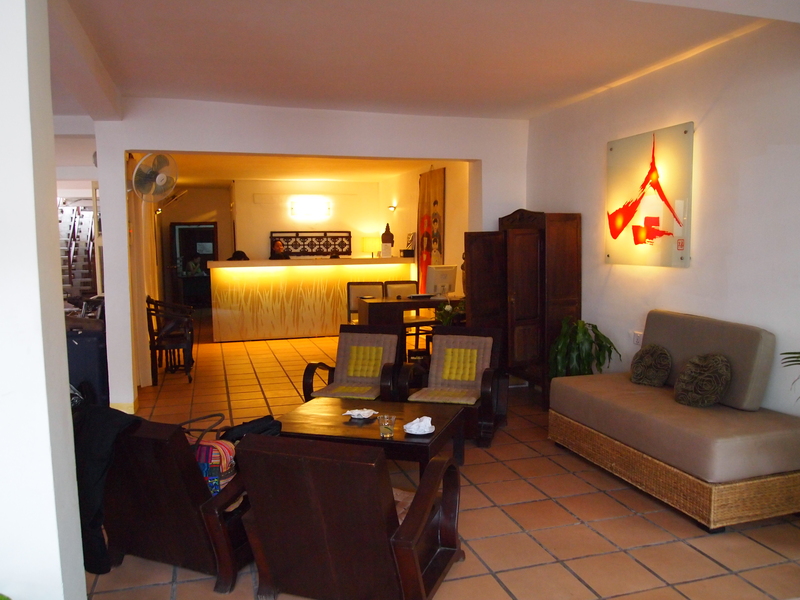 The Hotel Ngocmai calls a taxi for me, and back through the dark, through the yellow haze we go. I pay the hotel in advance for this taxi; I’m told the hotel pays the taxi directly. When we get to the airport finally, the driver asks for his tip. I look in my wallet and the smallest thing I have is a $10 bill. I am all out of Vietnamese dong. It’s not a problem here in Vietnam as they take dollars just as readily as dong. I take out the $10 and ask the driver if he has change, in dollars. He looks in his wallet and has only a few dong; not enough to give me change. And no dollars. I say, I’m sorry. I can’t give you a tip unless you have change. I am not about to give him $10 for a tip, when I’ve paid the hotel $15 already for the ride. The taxi driver whines: My tip, my tip! Where’s my tip? I don’t know what to do, but I cannot afford to give him $10. It’s mean, I know, but I tell him I’m sorry. And then I walk away. This bothers me the rest of the day. It still bothers me today. Should I have just given him the full $10? That didn’t feel right to me. But it didn’t feel right to leave him in the lurch either. At the time I was worried about my flight and checking in on time, etc. But later, I think, I should have gone searching in the airport for change. I feel like I committed some petty crime. If I had done this one thing right, I probably would have saved money on the rest of my trip. Because from this point on, I find myself giving bigger tips to everyone else I meet along the way as recompense to that poor taxi driver in Vietnam. Sometimes we can embarrass ourselves by own behavior. Believe me, I have done this many times in my life. I did something not good and it haunts me later. There is no shaking it. All I can do is to try to do better next time. That’s all we, as humans, can do. The flight is uneventful until I get to my all-time favorite airport of Guangzhou at 10:55. I’m worried because I only have one hour between my flights and I know they put you through unreasonable rigmarole at that airport. I feel relieved when I get off the plane because a woman from the airline is holding a card with my name on it and “Phnom Penh.” I say, yes, that’s me, and she ushers me to a special desk where she issues my boarding pass. I think, it’s going to be easy! But when she’s done she sends me through immigration after all, where the serious Chinese officials spend a great deal of time inspecting my passport and then they take it away and tell me to have a seat. I say, Where are you going with my passport? Of course, no one can speak English so I am left waiting and worrying what on earth could be the problem. After what seems like a long while, they finally return with my passport, and I go back into the cold basement of the airport to wait for my 11:55 flight to Phnom Penh. Another cramped flight with bad food, and a lot of turbulence. I don’t often worry much when I fly, but this flight is so rough, I’m doing a lot of praying. Finally, I arrive in Phnom Penh at 1:50 pm, where a driver from my hotel, the Villa Langka, is standing in the airport with a sign. I walk outside and am hit by a wave of heat. Oh, it feels so good. After being cold and getting sick in Vietnam, I’m thrilled to be warm. 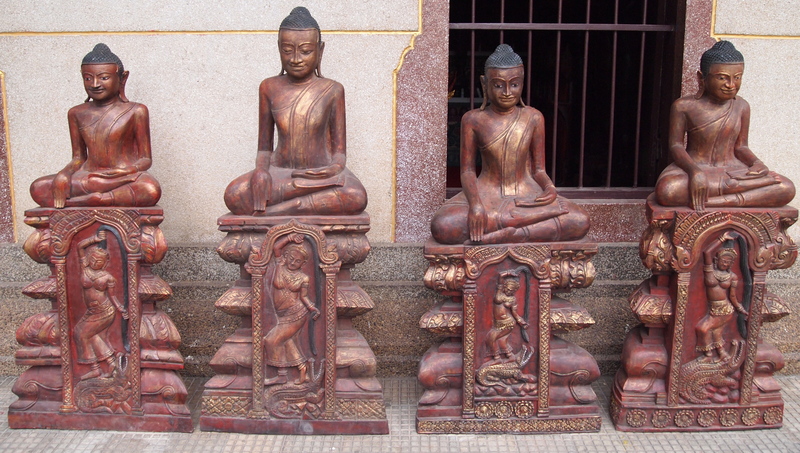 In the van, I strip off my layers and check out the streets of Phnom Penh from the airport to the hotel. It’s a much more sedate and classy version of Vietnam. There are motorbikes aplenty, but not nearly the numbers as in Hanoi. It’s bright, colorful, cheery, but also poor and scattered with rubbish. Not in-your-face rubbish, but rubbish nonetheless. We arrive at my hotel, which is beautiful for $42 a night. 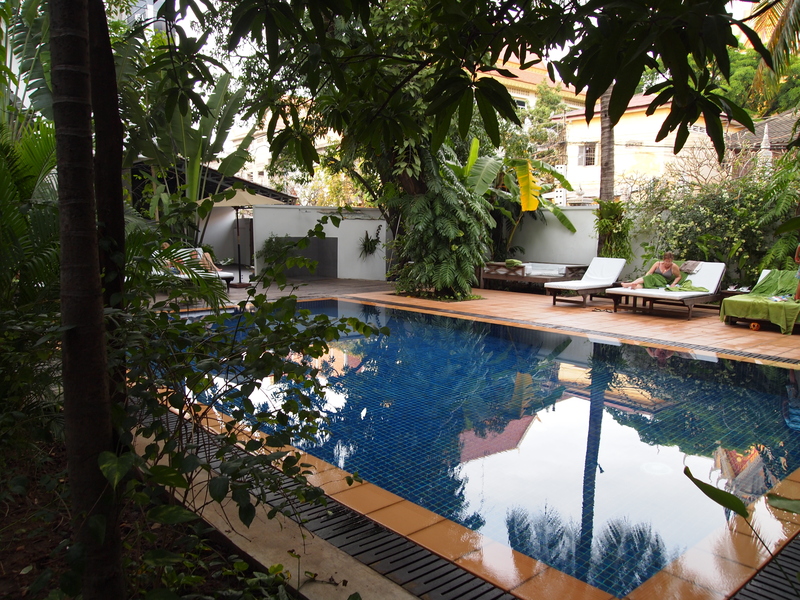 There is an open air lobby with tropical plants, an outdoor cafe next to a blue pool surrounded by leafy trees. 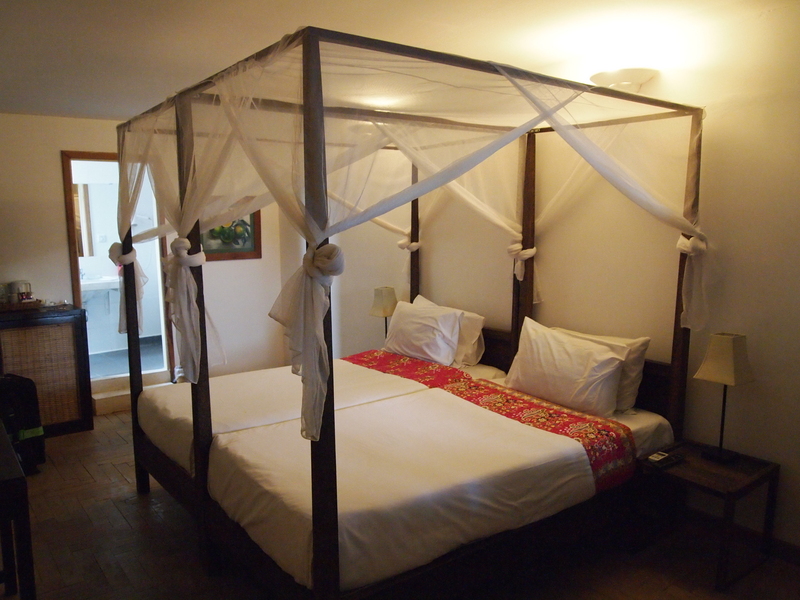 I check into my room, with two white-covered canopied beds pushed together, making a huge inviting expanse of sleep-beckoning glory. I lie down for a bit, then go out and sit by the pool and have a glass of red wine. Feeling quite happy by this point, I take a walk around the neighborhood. 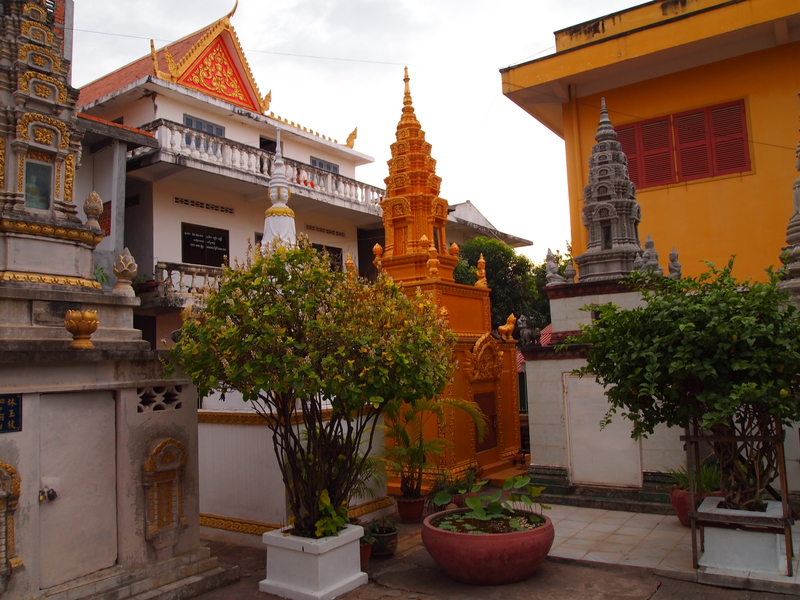 Directly across the small side street is Wat Langka, one of Phnom Penh’s five original wats (pagodas). 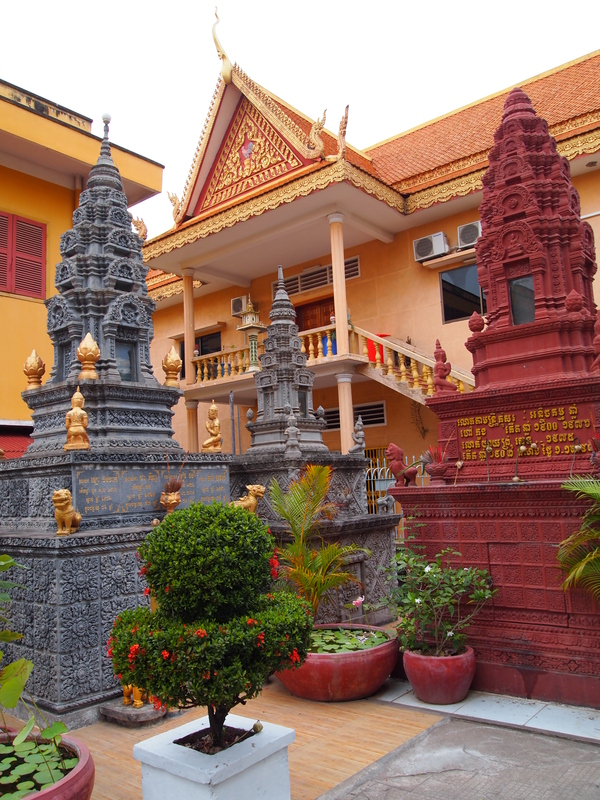 Founded in 1422 as a sanctuary for Holy Writings and for a meeting place for Cambodian and Sri Lankan monks, it escaped destruction as it was used as a storehouse by the Khmer Rouge. 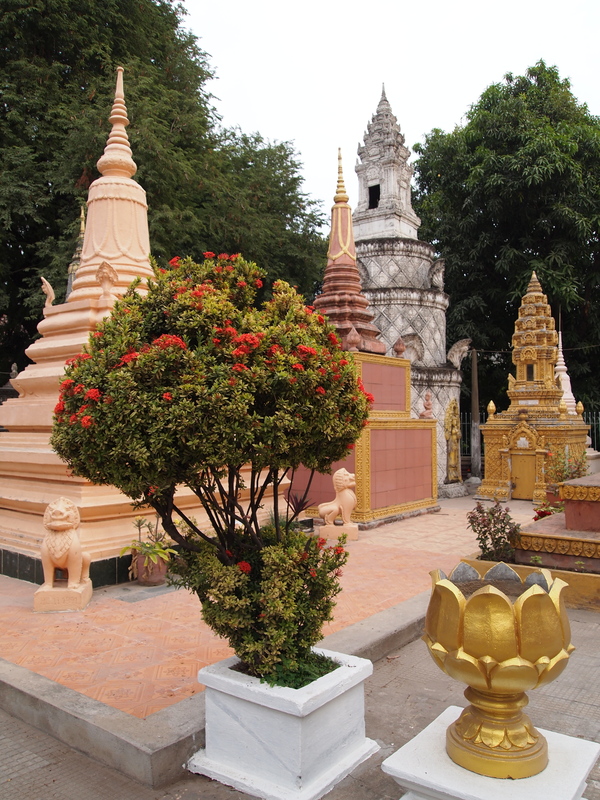 As I walk around, I am impressed by the huge Buddha statues, the offerings of fruits and incense, and the serenity on the grounds. 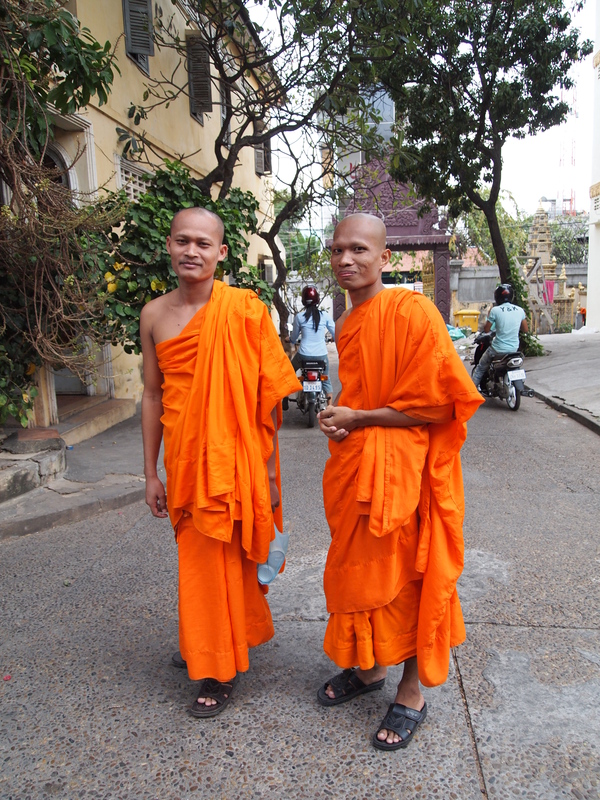 As I leave there, I run into two monks in orange robes, one of whom speaks English and asks me where I’m from and how I like Cambodia. Back outside the hotel, a couple of moto-remorks and their drivers are waiting patiently for customers. 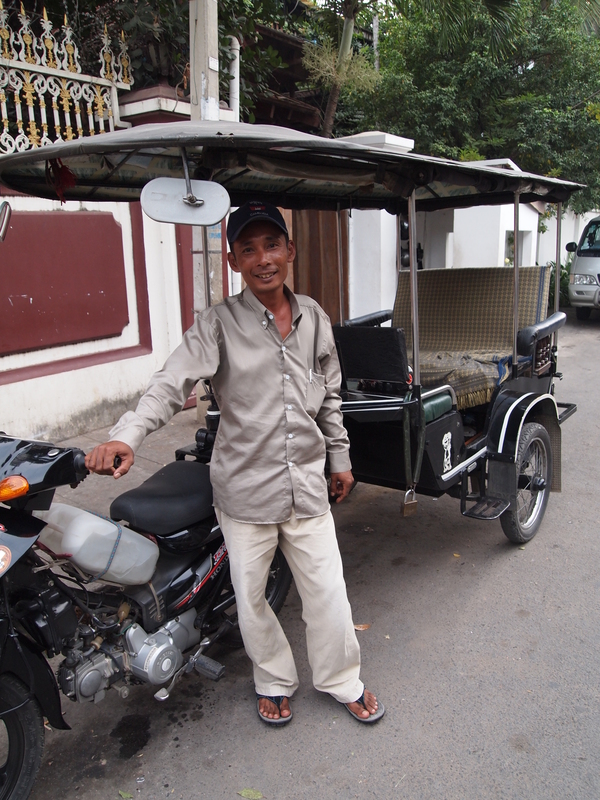 A remork is a cute, often fringed, canopied trailer hitched to the back of a motorbike. It can fit about 4 people comfortably. Tourists also refer to these vehicles as tuk tuks. A Mr. Lo introduces himself and asks me if I’d like to rent him for the day tomorrow. It seems I read you can hire one of these for $8/day, but I know I want to go to the Killing Fields and they are quite far out-of-town. I offer him $20 for the day; he agrees to meet me at 8:00 a.m. on Wednesday morning. After leaving Mr. 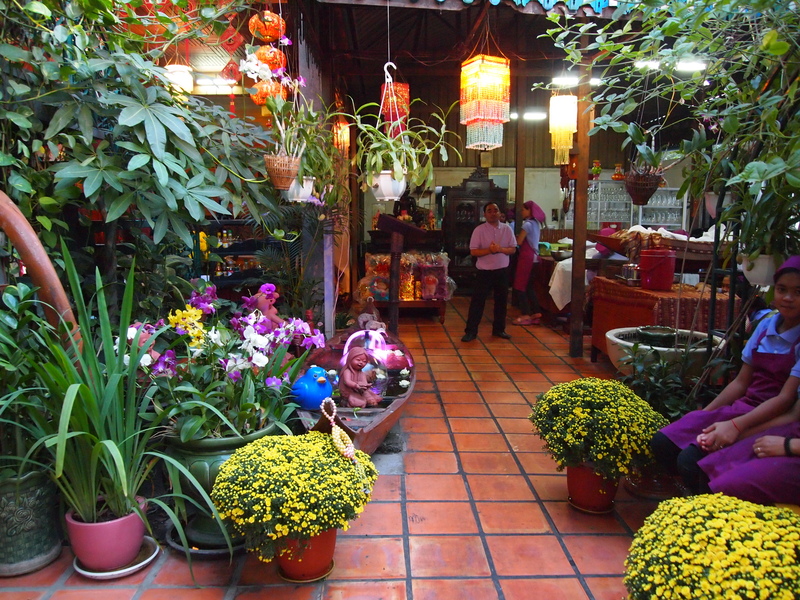 Lo, I take a walk to find the Lonely Planet-recommended restaurant, Malis. 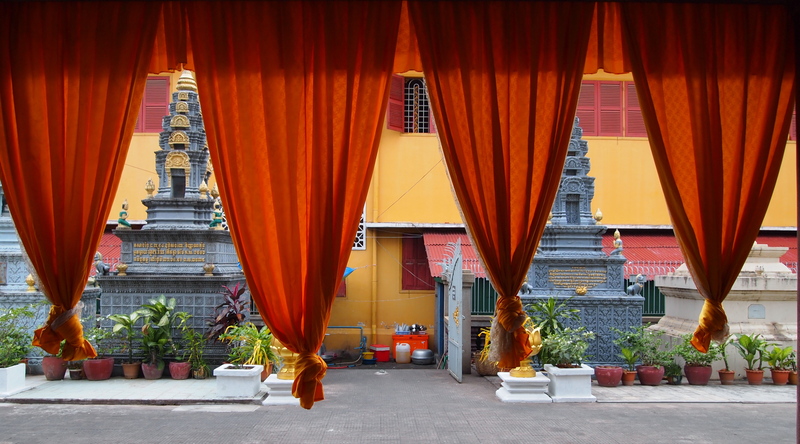 Walking along the street, I am captivated by the roar of the motorbikes, the tropical lushness, the bright-colored buildings in yellow, lime green and royal blue. I love the Cambodian lettering on street signs. When I arrive at Malis Restaurant, I find it is closed for some kind of renovation. 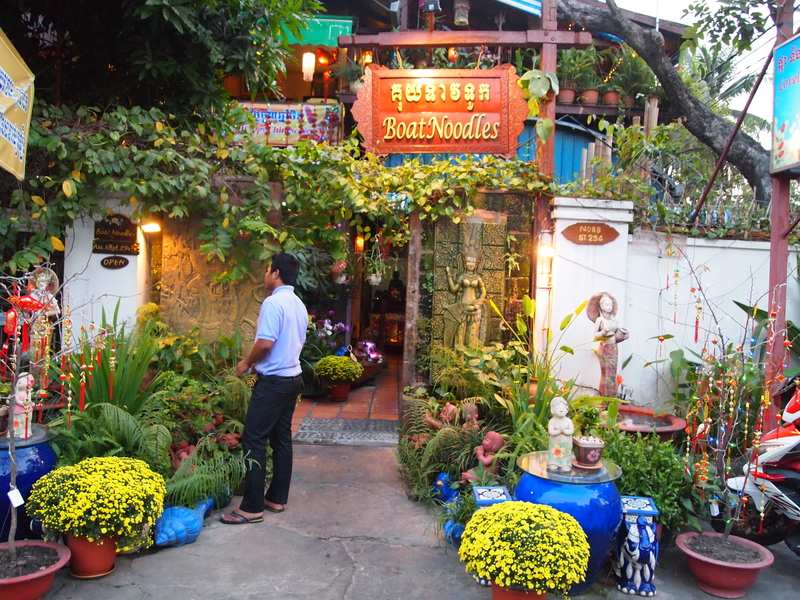 I then seek out the restaurant Boat Noodles, a two-story wooden open air restaurant abundant with greenery. From the second floor, I can see all the activity on the street corner below, the motorbikes, the tuk tuks, the cars, tourists and locals meandering along the sidewalks. I order a Tiger beer and a Cambodian specialty called Grilled Amok fish wrapped with banana leaf. It’s served with some light sauces, fragrant with cilantro. So far, I am loving the food in Vietnam and Cambodia! I try to take a picture of my meal, but I get the message again: CARD FULL! I have the new card I just bought last night in Vietnam, so I switch the cards. Then I take some pictures of my stunning meal before I gobble it down. After dinner, I look for a massage place recommended by a woman my age who is also staying at the hotel. 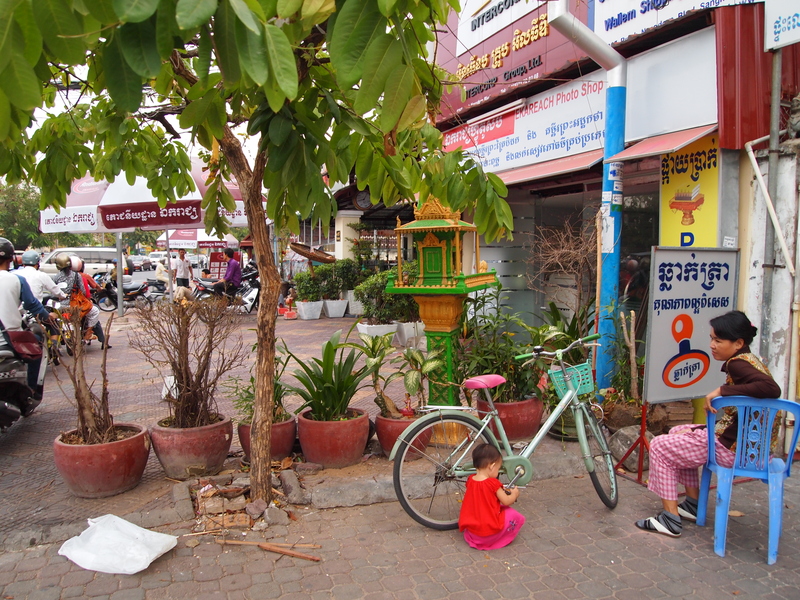 On the 2nd floor on a nondescript street, it’s difficult to find, but after riding up and down the street several times in the tuk tuk, I find OM, where I get a great hour-long massage by a tiny and limber Vietnamese girl for about $8. She doesn’t use any oil or lotions ~ I would have had to pay more for that. I feel my tight muscles turn to mush and when I leave, I’m floating. I know I’m going to sleep well tonight. 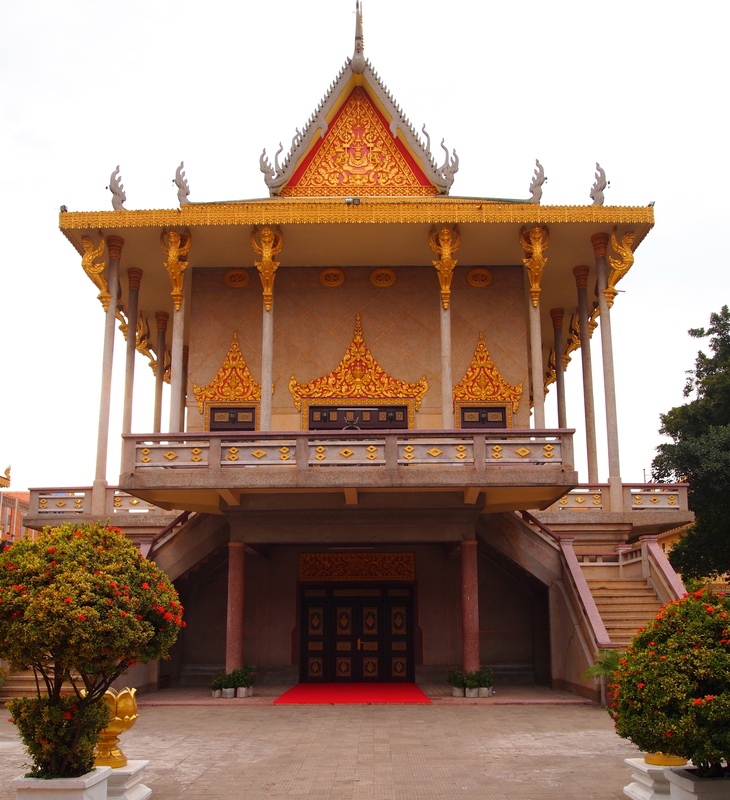 I’m tired from having been sick the last couple of days, and from my travel day, so I get in my white fluffy bed early and read my book, Eaves of Heaven, falling asleep in the dream world of Cambodia.